Laura has been awarded Overall Winner for Best New Restaurant in our Best of 2018 Awards. You can check out all the other winners over here. It's hard not to be impressed when you visit Laura. Sweeping vistas, thoughtful food and appropriately matched wines poured into individually hand-blown Austrian glassware. When you drive from the city, it's an overland route. Even driving into Pt Leo Estate, you are surrounded by vines with no view of the sea. 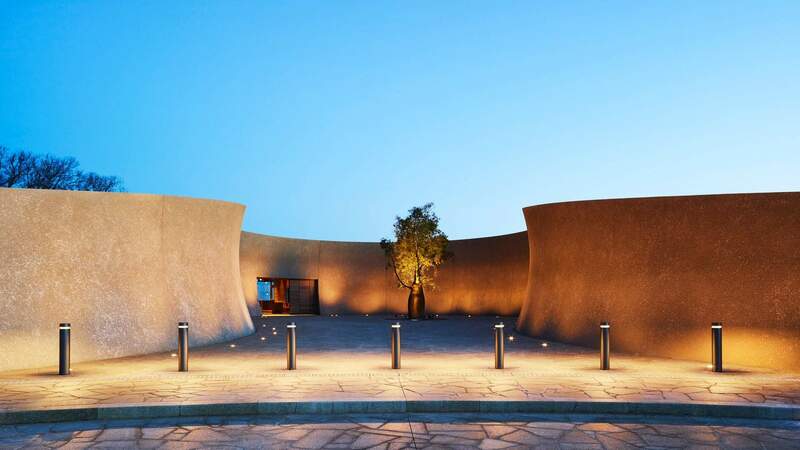 So the effect of entering the front doors of the cellar door and restaurant, seeing the verdant sculpture park running off down towards Western Port Bay and Phillip Island, is nothing less than breathtaking. Laura is an intimate dining experience where the idea is to put yourself in culinary director Phil Wood's hands and follow a six-course tasting menu ($160, wine pairing $90). You are also welcome to choose four ($120, wine pairing $70) or five courses ($140, wine pairing $80). The food side of the degustation takes you on a tour of the Mornington Peninsula with each course named after the location of the main element of the dish. The matched wines, on the other hand, are more of an international jaunt, with a couple of home visits in between. You'll find olive oil from Cape Schanck, Heritage Farm duck eggs and Main Ridge goat's milk amongst the entrée offerings. The Port Phillip scallop risotto with shiitake has warm, spicy notes with a subtle smokiness. It's served in a scallop shell and while this is not the place to lick the sauce clinging to the grooves, it's tempting. A buttery tart of flathead and potato is set off with a salty-sweet pop from the Yarra Valley salmon roe glistening on top, and then there's the meat. The coffee-glazed pork is juicy and tender with crackling you will find yourself staring off into middle distance and thinking about for days after. A flourish on the side is the sweet potato, baked in charcoal salt in the pizza oven, removed from the crust at the table and served with a hazelnut and porcini dressing. The French always say that a meal is not a meal without cheese and in Laura's case, you should heed their advice. You don't want to miss this flavour chapter from neighbouring Berry's Creek. Who knew blue would go quite so well with Pt Leo Estate honey, Puy lentils and pear? Clearly Phil Wood did. Highlights amongst the wines — of which there are 600 to choose from — are the 15-year-old sercial from the volcanic island of Madeira, a sake named after the fourth-generation female toji (master brewer) who makes it and the 2012 Pt Leo Estate chardonnay. At any point in your journey, your waiter will happily pour whichever wine you are drinking into a less precious glass so that you can take a digestive stroll around the sculpture park. Make sure you do a 360-degree turn around Laura, the restaurant's namesake and monumental cast-iron head from Spanish sculptor Jaume Plensa. Image: Anson Smart and Jason Loucas.